19 Sep 2014: Launch of website 'Shared Taste' and announcement of 'Shared Taste Lecture Series'. Venue: cafe 'Grote Beer', Rembrandtstraat, Leiden, 17:00 - 18:30 hrs. 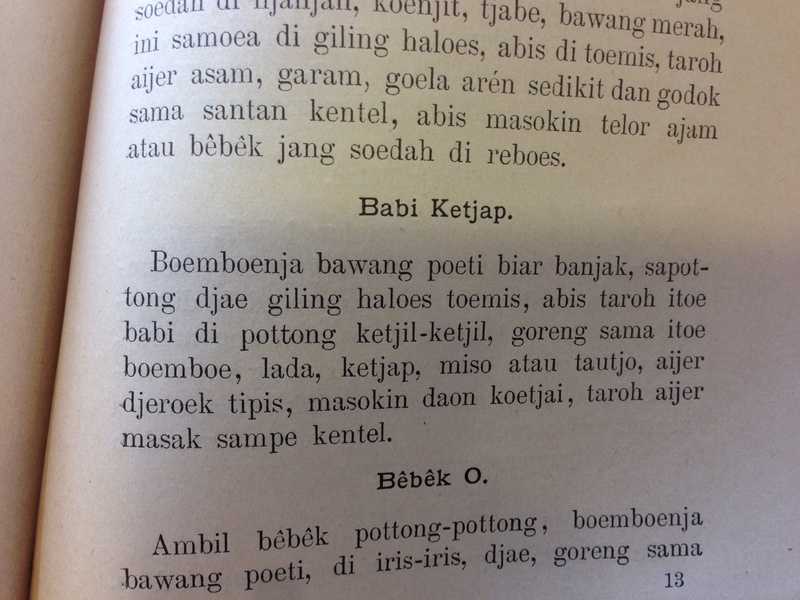 Let’s have a look at this text, a recipe from Kokki Bitja, Indonesia’s earliest printed cookbook. Published in Batavia in the mid- 19th century, it is a collection of short Indonesian, Chinese and even Dutch recipes, written in hybrid Malay mixed with Dutch words – as can be seen from recipe names like Kwe Tulband, Pastij Oedang, or Stoof Ayam. Today, March 20, 2015, Anne Gerritsen is featured in het Leidsch Dagblad, ‘De hele wereld drinkt thee‘, in an interview by Wilfred Simons. Thee – dat is een moment voor jezelf of voor elkaar. Wie thee drinkt, doet dat niet alleen om zijn dorst te lessen. Theedrinken is een ritueel of, zoals Anne Gerritsen zegt, ‘een moment van afscheiding’. Wie thee drinkt, gunt zichzelf rust, al is het maar voor even. De relatie tussen thee en ritueel heeft altijd bestaan. Soya sauce on Mount Fuji? Gallery 203 in the Metropolitan Museum of Art in New York is part of the Asian Art Department, and is devoted to Chinese ceramics. In particular, the porcelains presented here reveal ‘the interchanges between Chinese ceramics and those in other parts of the world’ . 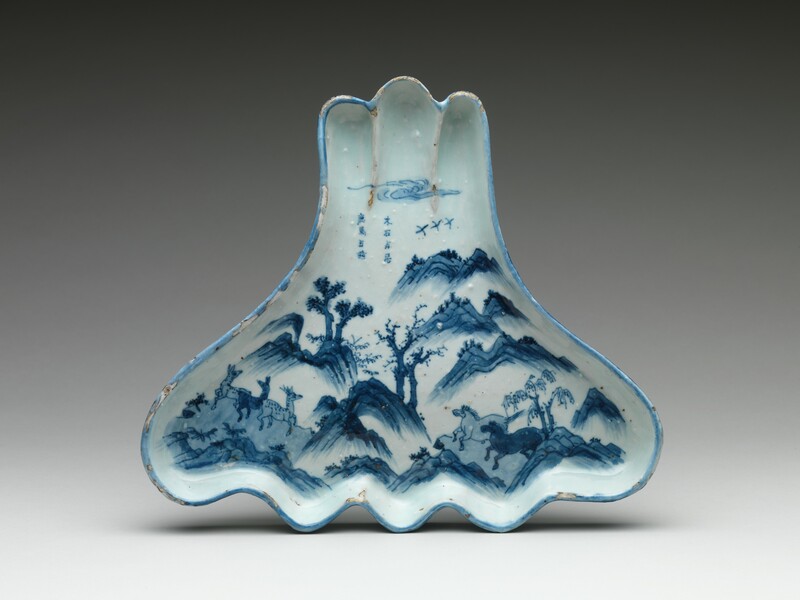 One of the selected items is this small dish (25.1 cm wide, and 28.5 cm long). In the second half of the eighteenth century, the botanist Martinus (Martin) Houttuyn described Japanese soy as follows: ‘een Lijmerig en niet onaangenaam ziltig Sap, dat in Flesschen overkomt, en, in plaats van Vleesch-Sap of Sjeu, over Erwten en andere Spyzen gegeten wordt om den Appetyt te verwekken’ (1). Roughly translated into English, the statement reads: ‘Japanese soya is a viscous and not unpleasantly savoury juice, which arrives in bottles, and is consumed instead of meat-juice or gravy with pulses and other dishes, to raise one’s appetite’. In our modern life style it is perfectly normal to go to the supermarket for some meat and veg, slice them in bite-size pieces and then X these in a wok or saute pan. When you think about what should come in the position of ‘X’, it is obvious we need a special verb here. We can’t use ‘roast’, ‘boil’, ‘fry’ or simply ‘cook’. These all do not sound right when using a wok. 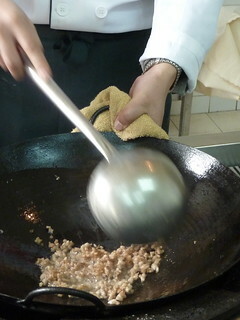 We need a special word to describe what we are doing when we are holding a spatula and preparing something in some hot oil in our woks, a verb which in Chinese is called ‘chao’ 炒. This multi-facetted research project explores the emergence and development of shared tastes as food and material culture were exchanged throughout the world between 1500 and the present. Food, material culture and social life are inextricably connected, in today’s world as much as in the remote past. Why 'Shared Taste'? There is so much to know on Asia, Europe and the role of food between us! We would like to start exploring texts, tastes and textures on this tentalizing subject, not only in the present day cultures, but also in the history of food, foodways and commodities.